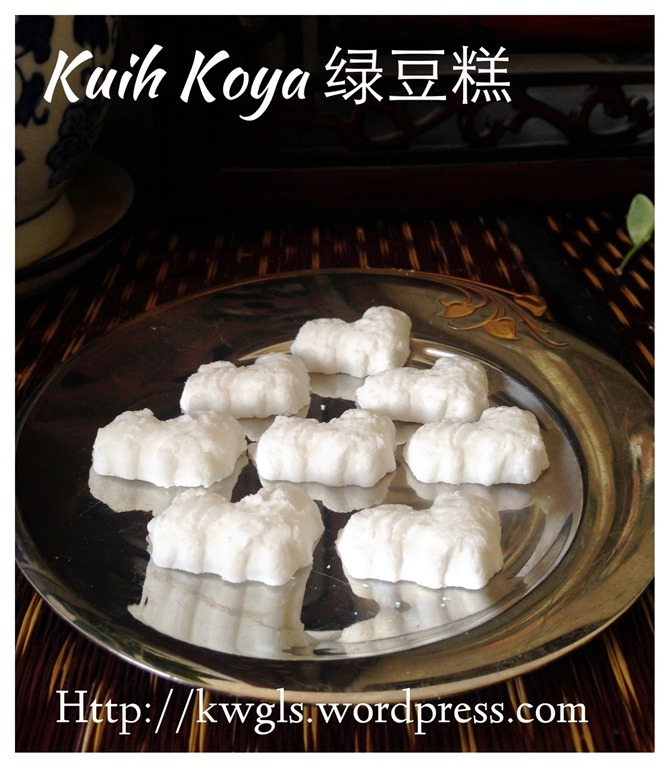 I blog this purely for the sake of keeping a record of our traditional cookies..This is one of the traditional cookies that grows up with me.. 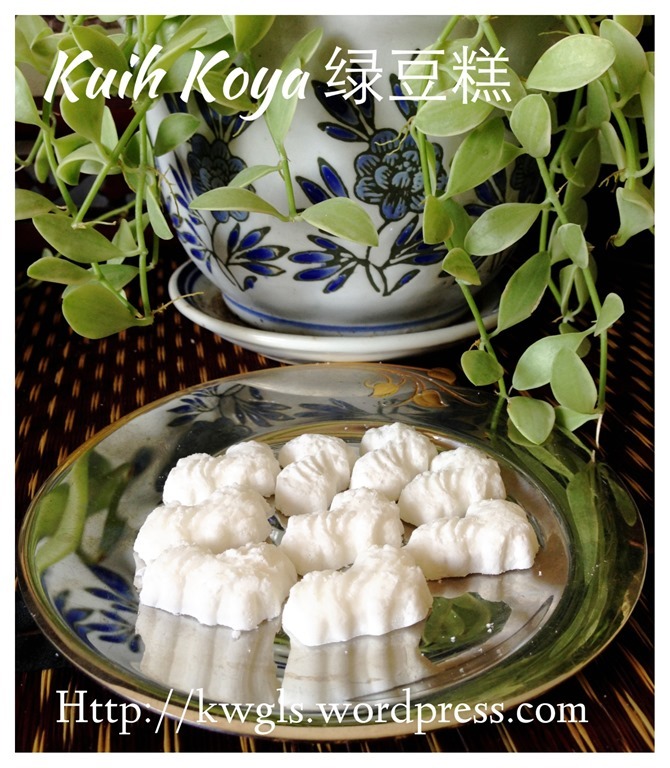 In the 70’s and 80’s, this cookie is very common and in fact, I recalled that during Chinese new year, this is one of the 2 types of moulded cookies that were available. 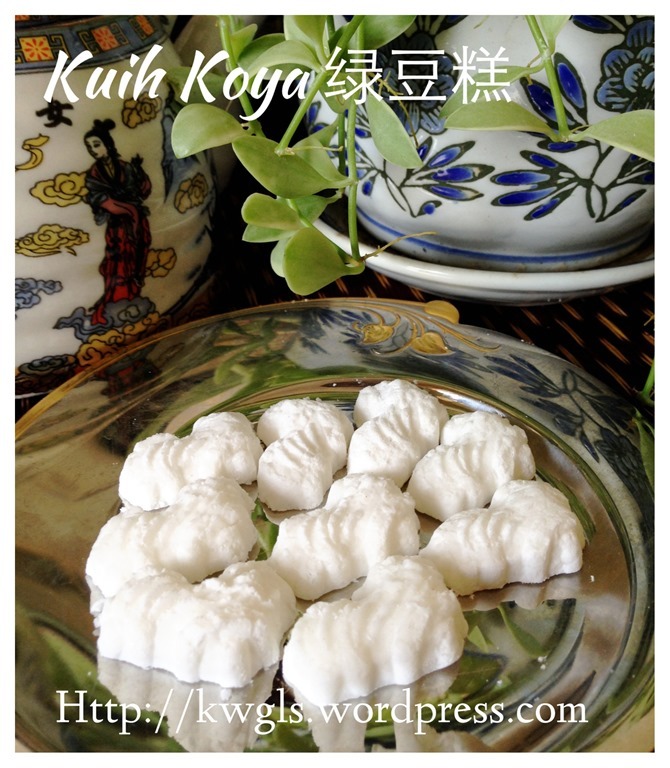 One is the famous Kuih Bangkit which is still quite commonly available and another one is this one.. the green beans cookies (绿豆糕 or lek tao ko) which is less common nowadays. 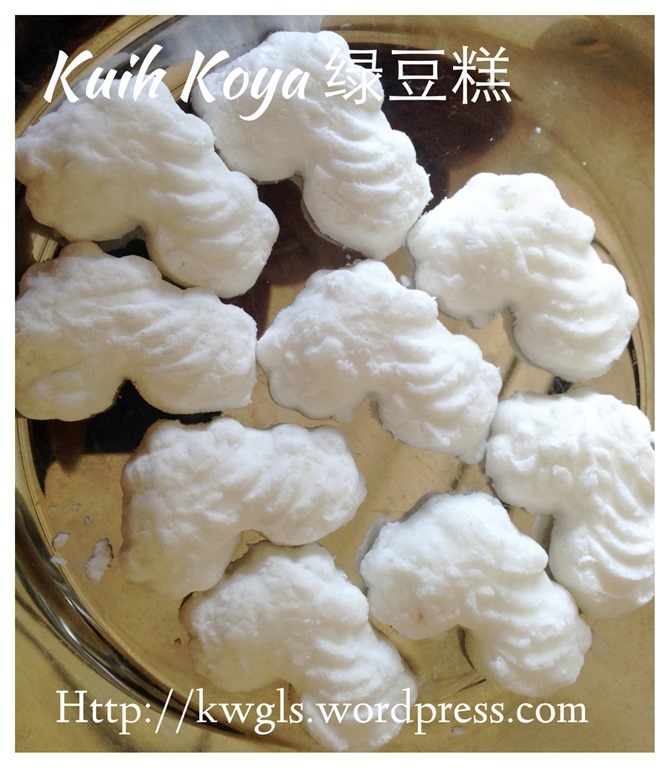 I do not expect any people will try this recipe because I believed most do not have the mould, and not even many readers may have seen or heard about this cookies. I posted in 4 Facebook groups, two English speaking, one Indonesian and another Chinese speaking Group. Apparently, those members who aged 40 and above can remember and I was surprised that the method of preparation and the ingredients is the same as Indonesian recipe. 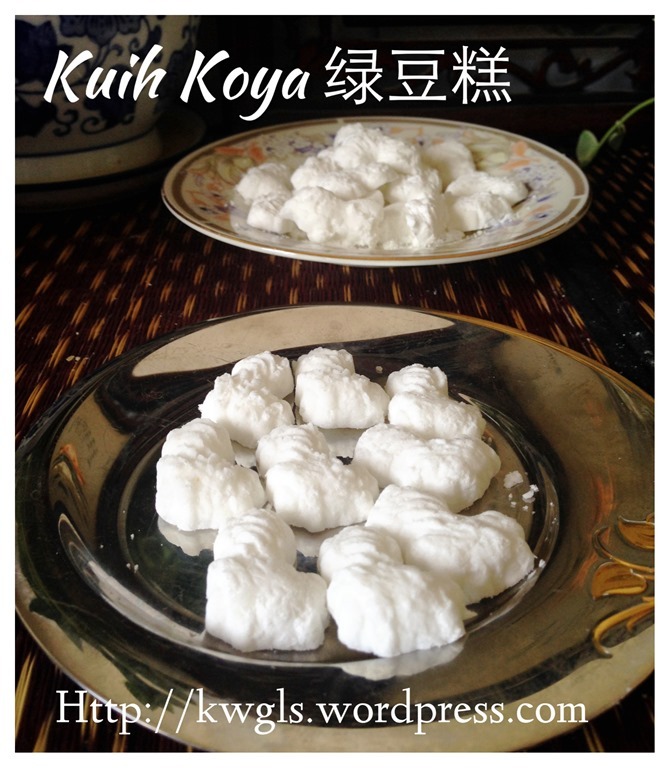 In Indonesia, it is called Kue Satu, some called it Putu Kacang Hijau and there are also those who called it as Kuih Koya. I have tried my very best to prepare this cookies and my moulding was rather lousy. As it is a new mould, it stuck in the mould and the imprint was a bit blur …However, the texture is melt in the mouth..
Pre-heat the oven to 150 degree Celsius. Put the green bean flour (mung bean flour) and pandan leaves in a tray, bake in the pre-heated oven of 150 degree Celcius for about 15 –20 minutes until the Pandan leaves curled up, aroma penetrates the house and look slight brownish. Open the oven door and stir for every 5 minutes. 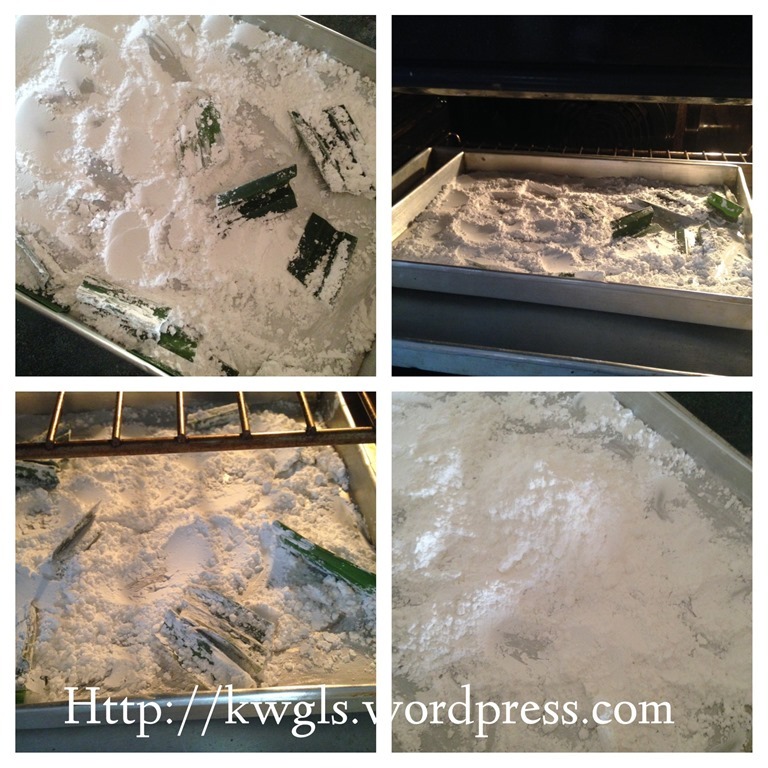 Let the flour cool and add in the icing sugar. Stir until well mixed. 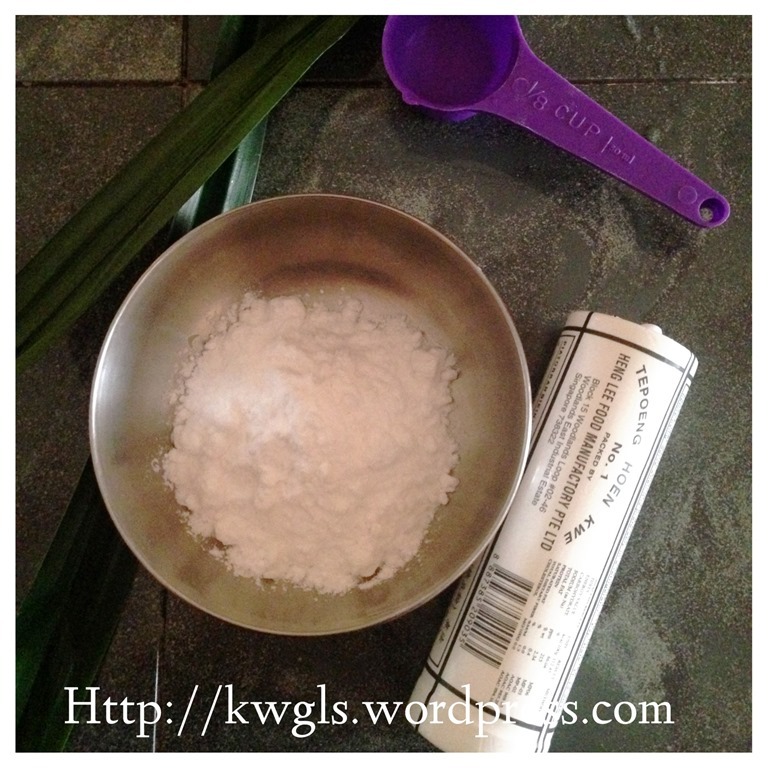 Traditionally, the flour and the Pandanus leaves were stir fried at low heat over the stoves. If the stir frying is long enough, the flour can become very brown. 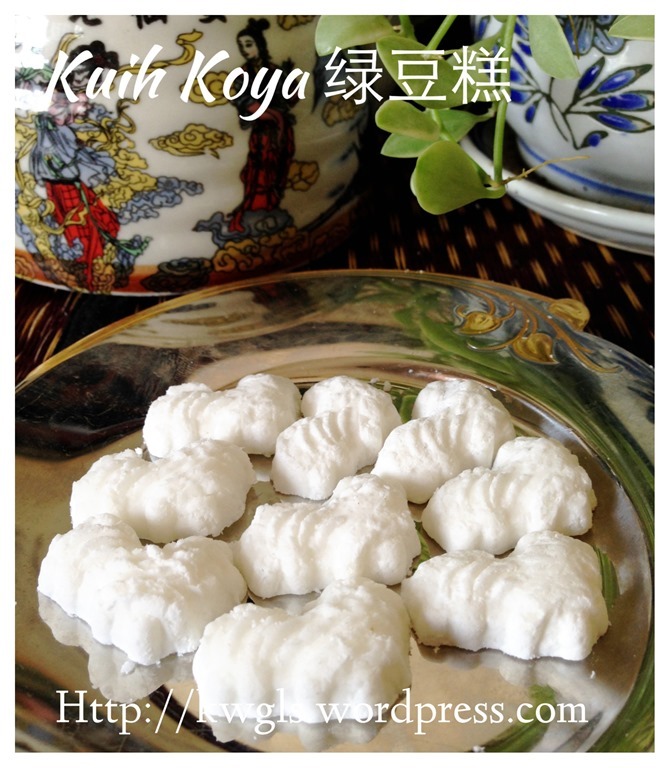 Sift the icing sugar and the cooked mung bean flour into a bowl. 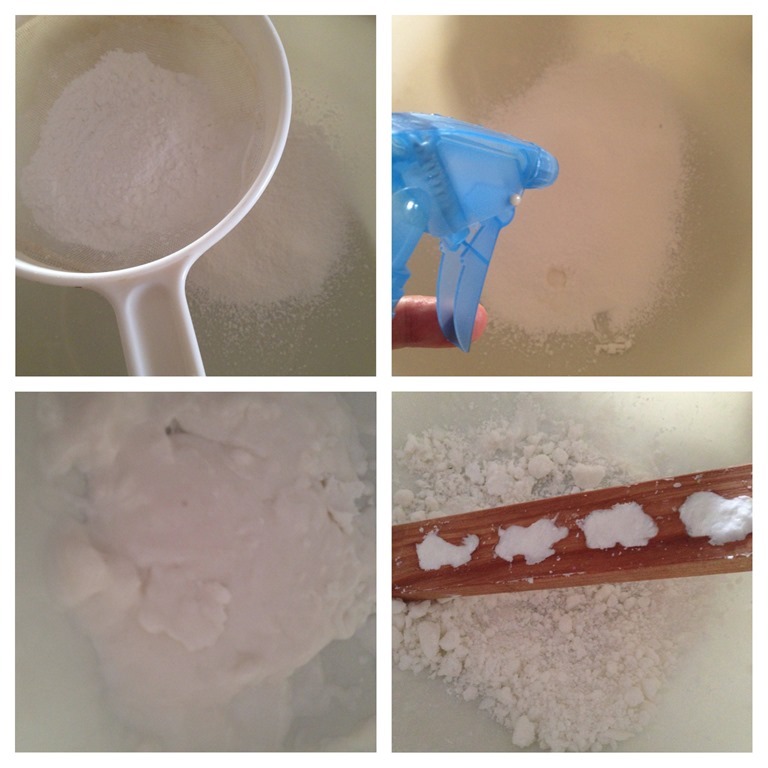 Sprinkle the water gradually until it forms a lump. 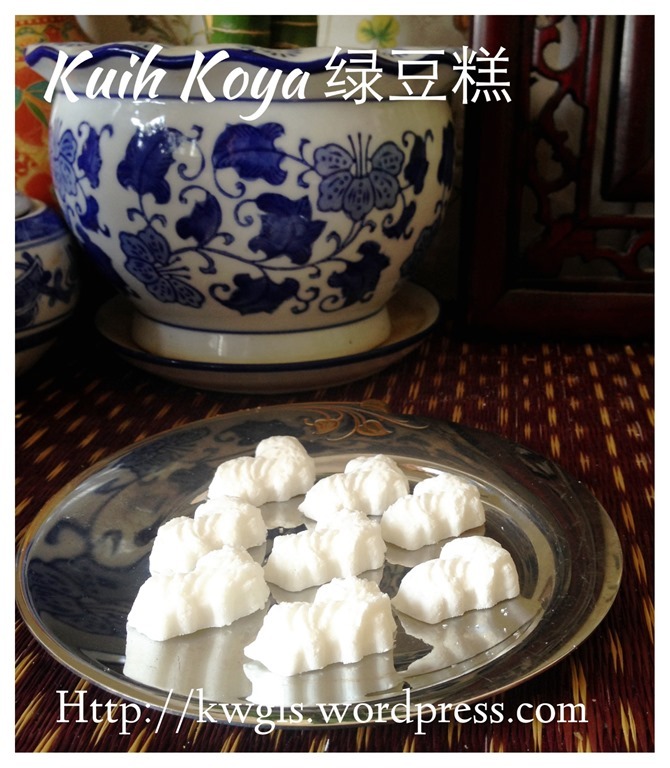 Once done , put some into the wooden kuih koya mould.press hard, level of the excess and dislodge by lightly tagged the side of the mould. 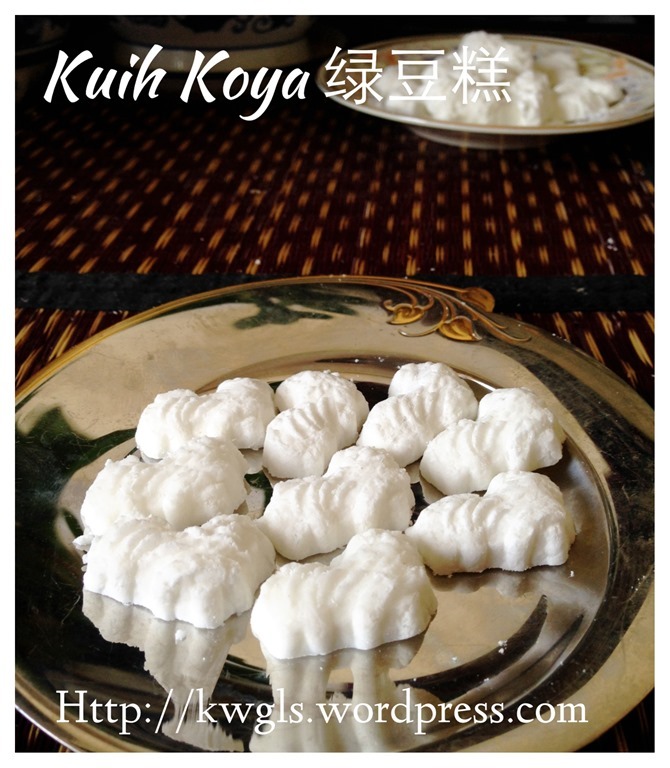 Dry the kuih under the sun or bake in the oven at 120 degree Celsius until dry. 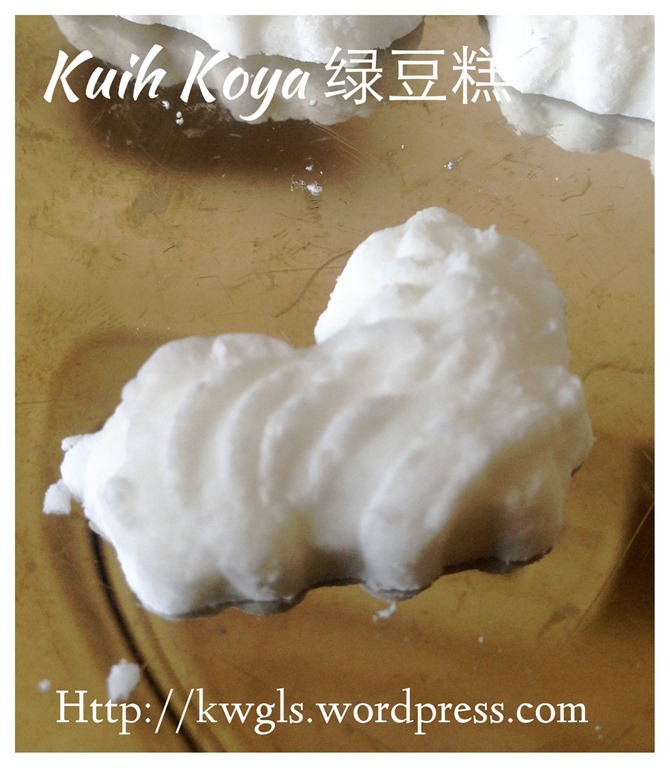 As I was preparing the Kuih Koya in a rush and the imprint was not good. I will prepare more in the next Chinese New Year and another set of picture will be uploaded. Whether white or brown is all depends on individual. If you want it a bit char and believed that it is more aromatic, you can bake or stir fry a bit longer. However, I used to eat the cookies in this snow white look, therefore I have purposely prepared it as such. Do give it a try for the sake of simple ingredients. This recipe was included in Page 3 and Page 4 of the following E-book. 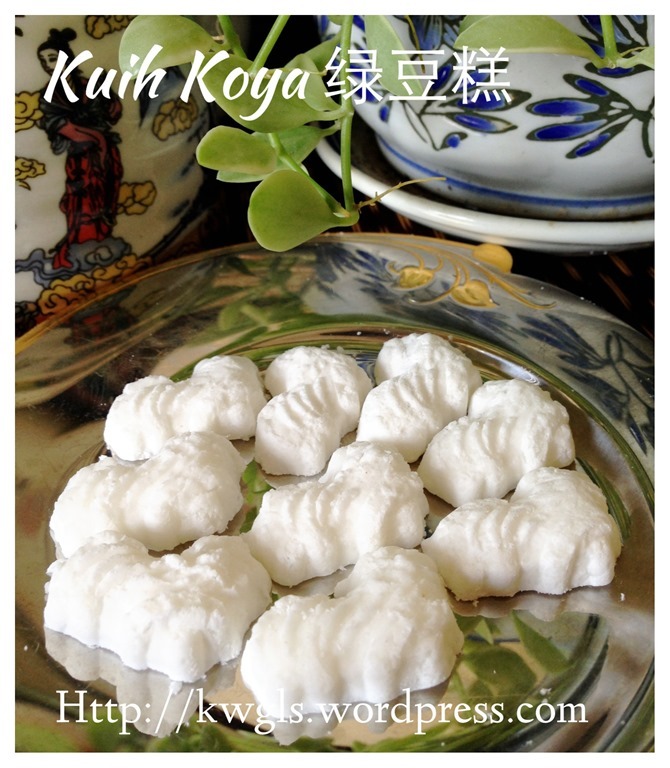 This entry was posted in Chinese and Asian Cakes and Snacks, Food Preparation Series and tagged 8, 绿豆糕， green bean cookies, GUAI SHU SHU, Guaishushu, kenneth goh, kue putu kacang hijau, kue satu, Kuih koya, kuih satu, lek tao ko, postaday. Bookmark the permalink. 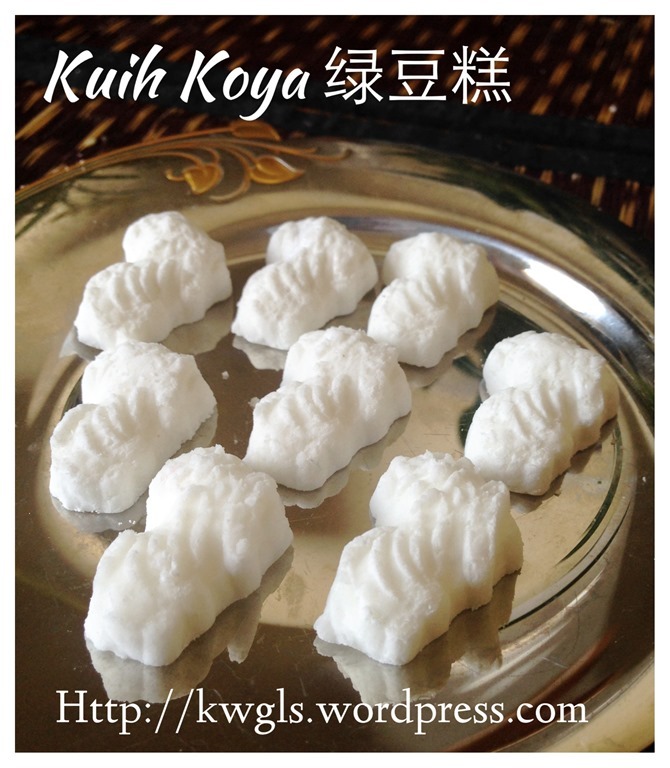 Sifu Kenneth where can I get the mould?